People walk through a terminal Friday, March 1, 2013, at Newark Liberty International Airport in Newark, N.J.
A LaGuardia-bound plane made an emergency landing at Newark Liberty International Airport after the flight crew reported smoke in the cockpit, the Federal Aviation Aviation Administration said. The Embraer 175 Aircraft took off from Louisville, Kentucky and was en route to LaGuardia, but rerouted to Newark “after the flight crew declared an emergency due to a report of smoke in the cockpit,” the FAA said. 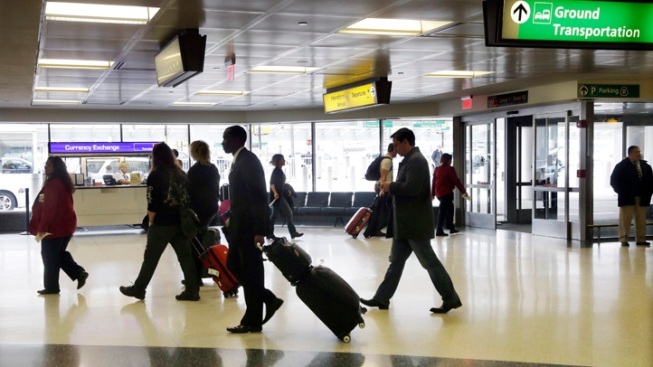 The plane landed at Newark Airport at 12:15 p.m., according to the FAA. The incident is under investigation, the FAA said.